← Fitlass Is Getting Bigger! Yes it’s that moment again that I’ve been roped into entering yet another competition. The pursuit of optimum health is never ending clearly. But that is the beauty of it – keeping fit should never turn stale. Always put yourself out there for new challenges so that you never get bored. 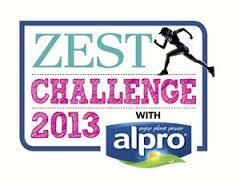 So I’m now training for the Zest Challenge 2013 with Alpro following their success from last year’s event. And because it was so successful they’ve decided to supersize the challenge by adding a 5k run to the usual 10k distance and having two locations instead of one so more people can join. The first is at the Hambledon Estate near Henley-on-Thames in Berkshire on June 15th and the second a week later on the 22nd at Catton Hall, Derbyshire. But unlike my normal straightforward runs, this women-only event has a twist. Rather than just running your way around a course, we’ll be scrambling over hay bales, under nets and through tyres, negotiating balance beams and flying down a giant water slide. Who says fitness is boring eh? So I’m a little late starting my training (I’ve been so absorbed in lifting heavy weight and body building!) but it’s never late to start. It’s all about making a plan and focusing on the goal and sticking to it. The human body never ceases to amaze me and I know you can do whatever you put your mind to. Well the weather is not bad right now in Reading, Berkshire so now is a good a time as any to go and get started. But I expect it to get windy, wet, muddy at some point over the next few weeks and burn some serious energy all in the name of fun! I'm a young, independent, career driven girl with a hectic lifestyle. Once upon a time I used to be fat but now I've changed my ways and lead a healthy lifestyle. I want to show you how YOU too can be fit and healthy and yet STILL have a lifestyle! This entry was posted in Weight Loss and tagged Alpro, Berkshire, Henley-on-Thames, muddy, run, Zest Challenger 2013. Bookmark the permalink.